Remember that class guides are a rough explanation of the class, designed to give you an idea of the class and what you should be aiming for. You should really adapt the guide and follow your own instincts to match your play-style! The Lahn class is a martial artist who comes from Eastern Valencia. They use a Crescent Pendulum as their primary weapon and a Noble Sword as their secondary weapon. At level 56, the Lahn unlocks their awakening weapon which is the Crimson Glaives, duel wield blades attatched with a chain. The Lahn class uses melee to mid range to slash at their enemies and quickly burst them down. She is a high damaging duelist with lots of protection skills, mobility and CC, as well as a long range grab. This class excells in 1v1 situations but when in mass PVP it is much harder to stay protected and do high damage at the same time. Lahn is one of the squisher classes in the game and during large fights, should look for smaller skirmishes, attack backlines, and pick off targets who are out of place. Lahn is also especially good in cannon teams or as a flex member. In PVE, Lahn is a fast grinder and can perform well in the top tier spots such as Aakman, Mirumok and Hystria. Check out the videos below to see some examples of the Lahn in action. Lahn is strong in 1v1 situtations and should most match ups of equal gear/skill if played correctly. Lahn struggles against other top tier duelist classes. If you’ve just reached level 50 or you’re still leveling, use this build to put you in the right direction of what skills you should be using. Make sure you reset your skills at level 56 though because you will need skill points for your awakening skills and will only really need the support skills from pre-awakening. Always prioritize Awakening skills before leveling your Absolute Skills. Keys in square brackets  mean that you tap the key. For example, [Q] means you tap Q once. Keys in round brackets () mean that you hold the key. For example, (HOLD Q) means you hold Q until the next step. (PERMAHOLD Q) means you hold Q throughout the combo. Keys separated by a “+” symbol should be used at the same time. For example, [Q] + [LMB] means you tap Q and LMB at the same time. [LMB] refers to left-clicking with your mouse, [RMB] refers to right-clicking with your mouse. Red skill names are optional. Blue skill names are awakening skills (level 56+). This skill is automatically skilled into when you level up and is your basic attack skill. It is a low damage skill used for regenerating your WP or gathering up monsters. This skill allows you to strafe to the side whilst auto attacking. It is a low damage skill but gives an Attack Speed +10% for 10 sec when used. Blooming Affinity is passive skill which increases your Max HP by +150. The skill is automatically leveled up once you reach level 15. This skill is your taunt/buff. When the taunt is used, it will attract nearby monsters towards you. You will recover 100 WP and you have super armor while using the skill. The skill also allows you to sprint without using stamina. This skill is your passive and can be leveled up to increase your attack speed. I recommend leveling up this skill when you have the spare points. This skill is your passive and can be leveled up to increase your movement speed. I recommend leveling up this skill when you have the spare points. This skill allows you to swap between your main hand and awakening weapon. This skill is your awakening auto attack skill. This skill is awakening buff. You have super armor when using the skill and it will give you Attack Speed +20%, Movement Speed +30% and All Resistance +30% for 30 seconds. With the buff active, the following skills do not consume stamina: Nimbus Stride, Primrose Sprint, Eye of the Phoenix, Bloody Stride, Phantom Dance, Eradication and Taunting Death in Annihilator state. This skill is your mid range grab skill. It doesn’t have any protection but is an excellect way to start a combo because of it’s range. The grab can also be used while in pre-awakening to switch to your awakening weapon and use the skill instantly. This skill is your roll. You can roll to the sides or backwards. You can also double tap [W] to roll forwards, or double tap in any other direction. This skill is your backwards dash. The skill has no collision and is also an iframe. It will also give an evasion buff when used. This skill is the lahn “flying” skill. When used you will dash forwards and into the air. It can be used to gap close very quickly and has high mobility. You also have super armor while using the skill and a movement speed buff when using the skill. The skill “Nimbus Dismount” enables you to use [SHIFT] + [A] OR [D] during the flight to drop to the floor quickly and safely. This extra skill has invincible when being used and will also give an evasion buff. This skill is an excellent gap closer with high range. The skill will make you charge twoards the enemy and will inflict stiffness on good hits. You also have forward guard at the start of the skill and whilst moving. Whilst using the skill, you can activate a kick at the end by pressing [F], or a dash slash by pressing [LMB]. Using this skill from your hotbar will switch you from awakening to pre-awakening instantly. This skill is your mobility skill while in awakening. It can be used with Crescent Pendulum to instantly switch to your awakening weapon and charge forwards. It can also be used twice in a row by holding W and SHIFT. This skill will make you quickly evade left or right. You are invincible if you use the skill while it is off cooldown, and will gain super armor if you use it during its cooldown. There is also no collision when moving. The skill can be used in pre-awakening to switch to your awakening weapon. Also, if you use this skill whilst your awakening buff is active ([SHIFT] + [E]) then you can use this skill repeatedly for the super armor without using stamina. Moon Slash will spin up to 10 enemies so their back is facing you (not in PvP). This skill must go on your quickslot hotbar and will inflict stiffness on up to 10 targets. The skill has super armor and the super armor also lingers when used so make sure you don’t cancell the animation too early at the end of the skill. Using this skill from your hotbar will switch you from awakening to pre-awakening instantly. This skill is an extension of other skill and will stun enemies on a good hit. The skill is risky to use because it doesn’t have any protection on it. This skill can be used during Nimbus Stride to drop down to the ground quickly and deal a powerful attack. The skill has super armor when used and will stun up to 10 targets (at max rank). This skill can be used during Nimbus Stride. It will send your main weapon down on towards the enemy and if it successfully hits, you will charge towards them. If unsuccessful, you will land on the ground. The skill has super armor when used and will inflcit bound as well as knocking back up to 7 targets (at max rank). This skill deals high amounts of damage and a 100% critical hit rate. It inflicts floating on good hits and has super armor when being used. In addition, a DP -15 for 10 sec debuff will be applied on the enemy if successful. This skill is useful for starting a combo and catching players off guard. It is a protected skil with CC. Using this skill from your hotbar will switch you from awakening to pre-awakening instantly. This skill is your 200% Black Spirit Rage skill. It has forward guard when being used (on 1 hit) and will will inflict bound on good hits and down smash on good extra hit. It also has a critical hit rate of +50%. You can also use the skill “Coax” by pressing [F] during Cymbidium. This has super armor and will pull the target towards you. Using this skill from your hotbar will switch you from awakening to pre-awakening instantly. You can use the skill “Coax” by pressing [F] during Cymbidium. This has super armor and will pull the target towards you. This skill can be used during Cymbidium to add extra damage. It has a floating and down smash as well as an air smash. You also have forward guard while using the skill. This skill can be used during Cymbidium to deal extra damage. The skill pulls up to 7 targets (absolute) and will also inflict a movement speed -10% debuff on them for 10 sec. You have forward guard while using the skill. This skill is a high damage dealing skill which will knockdown targets. It is completely unprotected though and very risky in PVP. This skill will knockdown targets and has a chance of down smash. The skill has forward guard when you use the skill and then super armor during the attack animation. This skill can be used on its own or after/during other skills (Phantom Dance, Bloody Stride, Primrose Sprint) to deal extra damage. The skill will pull you towards your opponent and deal damage. It has a chance of stunning the target when used. This skill will inflict stifness on good hits and also give an AP buff. It is completely unprotected and is risky to use unless to follow up on other CC. This skill is a flow skill for Taunting Death and is your 50% Black Spirit Rage skill. The skill inflicts pain damage as well as a movement speed debuff and knockdown on good hits. The skill will also give you HP recovery. This skill is best used in the middle of a combo for additional CC since it does not have any protection. The Black Spirit Rage of the skill can be used in large scale PVP but is not particulary useful in a 1v1 or small scale situation. This skill can be used straight from your Crescent Pendulum by pressing W and F. The skill recovers HP, WP and inflicts bleeding damage. It also has a floating and air smash on good hits. This skill is better used in the middle of a combo because it doesn’t have any protection on it and can be very risky to use on its own. This skill is deals high damage and has bound and down smash on good hits. It will also debuff the target with attack/casting speed -10% and will recover your HP and WP at the same time. This skill is better used in the middle of a combo because it doesn’t have any protection on it and can be very risky to use on its own. This skill can be used during Furor to deal extra damage and knockdown targets. The skill recovers your HP and WP and has super armor when being used. This skill is your 200% Black Spirit Rage skill. The skill deals high damage and has super armor when being used. You can also use this skill by pressing RMB after Flailing Blades. Flow: Vice can be used during Tailspin or can be added to your quickslot hotbar to cast instantly. If used with quickslot, it can be cast while using your main weapon to switch to awakening. The skill has a down smash and super armor when being used. This skill is your 100% Black Spirit Rage skill. It will deal damage to enemies in front of you and has a 50% Critical Hit chance. If it successfully hits it’s targets, you will inflict bleeding damage and stun targets. The skill must be placed on your quickslot hotbar to be used. The skill is risky to use because it doesn’t have any protection on it and leaves you standing stationary. You can also use this skill to switch from pre-awakening to your awakening weapon. This skill can be used on its own or during Bridled Despair/Flailing Blades by pressing LMB and RMB. The skill will pull the target towards you and knock them back as well as inflicting bound on them. The skill has super armor when being used and is also your 25% Black Spirit Rage skill. This combo is a high damage combo designed to keep the target CC’d. After using Phantom Dance, get behind the target do deal the final blow. You can also start the combo using Salp’uri Purge if your grab fails and is on cooldown. This combo is used to extend your Nimbus Stride for more mobility. It will use the whole flight of Nimbus Stride again instead of activating the flow straight after. Press C then A or D whilst in the air. Make sure to hold SHIFT and SPACE the whole time. I would recommend trying out both of these skills and testing which you prefer. It really comes down to personal preference. Phoenix Chase has a stun, while Eyes of Blood has a bound and lower cooldown. Using either of these skills from your hotbar will switch you from awakening to pre-awakening instantly. I would recommend White Heron. It is considered the better Rabam skill of the two, because it has better protection on the skill as well as a DP debuff on enemies hit. Using White Heron from your hotbar will switch you from awakening to pre-awakening instantly as well. The best weapons in the game are currently dropped from World Bosses. For more information on this click here to view our World Bosses guide. The Rosar Crescent Pendulum is what you should be aiming for to level your character. You should enhance it to at least +7 for leveling and then PRI or higher as soon as possible if you don’t have Liverto/Kzarka. Aim to buy a +15 Rosar Crescent Pendulum if you can to save your enhancing resources. Ideally you will want to buy or make it ultimate (yellow) to close the AP difference as well. Make sure you also make use of the gem slots to get your Attack Speed and Critical Hit up to 5. You can skip Liverto and go straight from Rosar to Kzarka if you don’t have much silver or you are lucky with obtaining Kzarka. If you have enough silver and decide to invest in Liverto, aim to buy it at +15 or higher to save enhancing materials. You will want to upgrade it to PRI or higher as soon as possible. I would recommend getting it to TRI at most and then you really want to switch to Kzarka. The liverto has slightly more AP than Rosar, but it also has a Critical Hit Rate +3 item effect. Kzarka is the “best in slot” main weapon for all classes for PVP and is a requirement for end game PVP. It has the same AP as Liverto but more accuracy and an Attack Speed +3 item effect. Offin Tett’s weapon is similar to the Kzarka but has a slightly higher AP once you reach TET/PEN. It is not worth investing in until you are over 270AP and are looking for small AP improvements. Ascending Noble Sword is your accuracy offhand and also has a bit of DP. It is the best offhand to go with for beginners and is also worth keeping because it is very effective against high evasion enemies/classes. You should aim to get this weapon to +15 as soon as possible, but make sure to prioritize your main hand and awakening weapon first. You can also ulimate the Ascending Noble Sword for a small accuracy increase and special attack extra damage +1 level effect. The only downside to this offhand is that it only has 1 crystal slot and is not considered best in slot. Crow Noble Sword is your AP offhand. It is the best offhand to go with if you are leveling Lahn as an alt or you already have Bheg’s gloves. You should aim to get this weapon to +15 as soon as possible, but make sure to prioritize your main hand and awakening weapon first. You can also ulimate the Crow Noble Sword for a small accuracy increase and special attack extra damage +1 level effect. The only downside to this offhand is that it only has 1 crystal slot and is not considered best in slot. Kutum Noble Sword gives a mixture of AP and DP with added monster damage and accuracy. It also has an item effect of 10% ignore resistance and 2 gem slots. The monster damage and accuracy on this weapon undeniably make it best in slot for PVE. You can also turn this offhand into the Fiery Noble Sword of Kutum using an Inverted Heart of Garmoth. This adds extra stats to your weapon. Nouver Noble Sword is considered the current best in slot choice for Lahn once you are at softcap gear with a good amount of AP and accuracy already. You should aim to have at least 350 accuracy with this offhand before switching to it. The weapon gives pure AP and an all resistance +10% item effect. The Nouver is highly effective against enemies/classes with high damage reduction. If you are lacking the money to upgrade Nouver then Ascending is a very good alternative and you should keep it and switch between Ascending/Nouver depending on your target. You can also turn this offhand into the Fiery Nouver Noble Sword using an Inverted Heart of Garmoth. This adds extra stats to your weapon. This is a green grade weapon which is sold by some Blacksmith/Arms dealers. You will also receive a +10 of this weapon when you complete your awakening quests. This weapon has lower AP than the other options but it is still viable for PvE due to it’s Damage Against Every Species +5 item effect. It’s also much cheaper to enhance and repair max durability than the other options so if you don’t have a lot of money or participate in a lot of PvP, then this weapon is a good alternative until you get Dandelion. Dandelion weapons are the BiS awakening weapons. It has much higher AP but it is only obtainable from a Dandelion Weapon Box (Karanda world boss loot) or from the night vendor. The best armor in the game is currently dropped from Bosses. You will want to aim to get the boots and gloves first. Griffon’s Helmet (helmet) – dropped from Griffons in Kamaslyvia. Dim Tree Spirit’s Armor (chest) – dropped from Dim Tree Spirit. Bheg’s Gloves (gloves) – dropped from Bheg. Urugon’s Shoes (shoes) – dropped from Monastery Leader. Giath’s Helmet (helmet) – alternative choice – dropped from Giath. Muskan’s Shoes (shoes) – alternative choice dropped from Monastery Leader. A popular armor choice is to go full Grunil set because it increases your maximum HP and will give you 2 socket slots on each piece, along with extra AP +7 set bonus. Another advantage of using this set is that it is viable on any class, allowing you to swap to another class easily. Full Heve set is also a very popular choice because it has an easier transition to boss gear whilst. As soon as you get one boss item with Grunil, you lose the set bonuses which Grunil weaker. There are a lot of choices available when it comes to accessories and it really depends on what you can get your hands on. If available I recommend using the Asula’s Crimon Eye Earrings (Asula Set) if you are new to the game, this gives you 7 AP and also has very good set bonuses. Otherwise use Bares earrings for 2 AP and switch to Witch’s Earring as soon as possible for the 5 AP. You want to aim for DUO/TRI Witch’s Earrings (9 AP/11 AP) before swapping to a DUO Tungrad Earrings (11 AP) because of the huge difference in cost. Tungrad Earrings are BiS earrings. The Capotia Earring is also worth mentioning. It is available at level 62+ only but is a very good earring because of it’s high AP. It makes a perfect backup for enhancing and is essentially a free TRI Tungrad Earring. If available I recommend using the Asula’s Crimon Eye Ring (Asula Set) if you are new to the game, this gives you 7 AP and 2 DP as well as damage reduction and strong set bonuses. Otherwise use Bares rings for 2 AP and switch to Mark of Shadow as soon as possible for the 5 AP. Sahazad’s Ring of Monarch is also available through the Valencia part I and II quests. It can’t be enhanced but it is a good alternative until you can get Ring of Crescent Guardian or Mark of Shadow to PRI/DUO. The current best in slot, is a Ring of Crescent Guardian, or Eye of the Ruins Ring. The Capotia Ring is also worth mentioning. It is available at level 61+ only but is a very good ring because of it’s high AP. It makes a perfect backup for enhancing and is essentially a free TRI Ring of Crescent Guardian. If available I recommend using the Asula’s Crimon Eye Necklace (Asula Set) if you are new to the game, this gives you 11 AP and 3 DP as well as damage reduction and an amazing set bonus. Otherwise use Bares Necklace for 4 AP and enhance this to DUO/TRI for 8 AP/10 AP. Enhancing a Bares Necklace is much cheaper than using an un-enhanced BiS necklace. You then want to swap to a DUO Serap’s or PRI Ogre/Tungrad. The Manos Necklaces are also an alternative for PvP, if you don’t have a DUO Seraps already, due to their item effects. I personally wouldn’t bother with them though because you will want as much AP as possible. If available I recommend using the Asula’s Crimon Eye Belt (Asula Set) if you are new to the game, this gives you 6 AP and has amazing set bonuses. Otherwise use Bares Belt for 2 AP and swap to Tree Spirit Belt as soon as possible for more AP and high accuracy. You want to aim for a PRI/DUO Tree Spirit Belt before swapping to DUO Basilisk’s because it is much cheaper and easier to get hold of. Basilisk’s Belt and Valtarra are very good belts but Tungrade is currently the best in slot. These are an example of the best sockets for your class. There are different crystal you can go for depending on your gear setup. These crystals cost a significant amount of silver. These are an example of some cheaper crystals for your class if you don’t have as much to spend. This example is for a Liverto weapon, you should aim to always have 5 attack speed and may need to use food buffs. 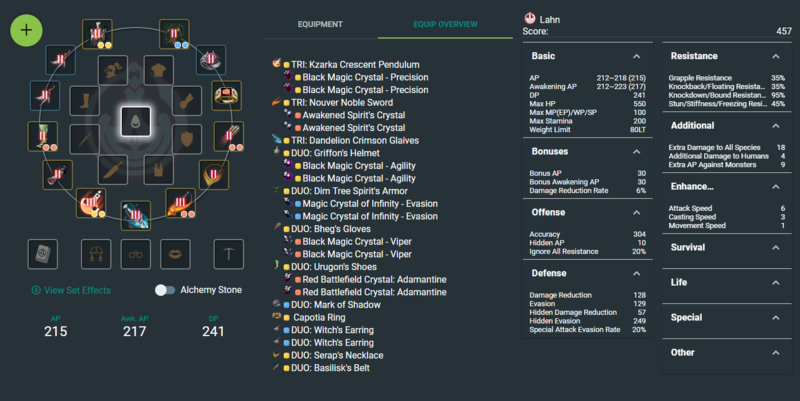 I highly recommend using BDOPLANNER.COM to help you plan your build and track your progression. Below are some example builds to help you when gearing up and understand what to aim for. Click images to enlarge. Here is what to aim for when leveling and before you get your boss gear. You should focus on enhancing your weapons first and then your armor. Try to also ultimate all your pieces as soon as possible, especially your armor because it will give quite a big DP boost. Here is a mid-tier build to use if you are looking to improve your gear before you get boss gear. You may want to use Red Coral Earrings or Witch’s Earrings instead but they can be quite expensive compared to the rest of the gear. Here is what to eventually aim for if you are going for a full AP damage build. It takes a long time to get to this stage, and there are lots of small improvements and other accessories you will use along the way, but this is ideally your end game build for PVP damage. You can also use one Red Coral Earring and a Tree Spirit Belt for extra accuracy if you need it. Here is what to eventually aim for if you are going for a full AP damage build. It takes a long time to get to this stage, and there are lots of small improvements and other accessories you will use along the way, but this is ideally your end game build for PVP damage. Here is what to aim for high level PVE, such as Mirumok, Hystria or Aakman. Kutum is very important for end game PVE. You will need 240 AP or higher with a TET Kutum for most Mirumok groups. When grinding, use EXP Elixirs and Milk Tea, then other food of your choice such as Margoria Seafood and Serendia Special. It really depends on your preference. For your food rotation in node wars/siege, I would recommend using Knight Combat Rations, Kamaslyvia Special, Valencia Special and then King of Jungle Hamburger in that order. If you don’t have 5 Critical Hit Rate then you may want to swap Margoria Seafood for the Kamaslyvia Meal because it’s very important to have 5 Critical Hit Rate. Make sure you use Margoria Seafood last because it has the smallest duration and you want to keep all your buffs up as long as possible. For your elixir, you will want to use the Cron Draught, Giant’s Draught. To create this, press “L” then select “Simple Alchemy” and add the ingredients listed below. You do not need any alchemy/processing profession level to craft these. Cron Draughts will replace any elixir buffs you have used and cannot be stacked with other elixirs (excluding Perfume of Courage, Perfume of Swiftness, Elixir of Deep Sea, Khalk’s Elixir, Spirit Perfume Elixir, Whale Tendon Elixir or Tough Whale Tendon Elixir). If you consume a Draught Elixir whilst another one has already been used, it will replace the first Draught Elixir. Cron meals and Cron Draughts (elixirs/alchemy) can be used together. Also, when crafting Cron Draughts, you can substitute ingredients with higher grade ingredients. For example: instead of using Elixir of Shock x3, you can use Elixir of Strong Shock x1.